A project that expresses a moment of change in the town of Pomonal – maintaining the memory of the existing hall within a contemporary place for its community. 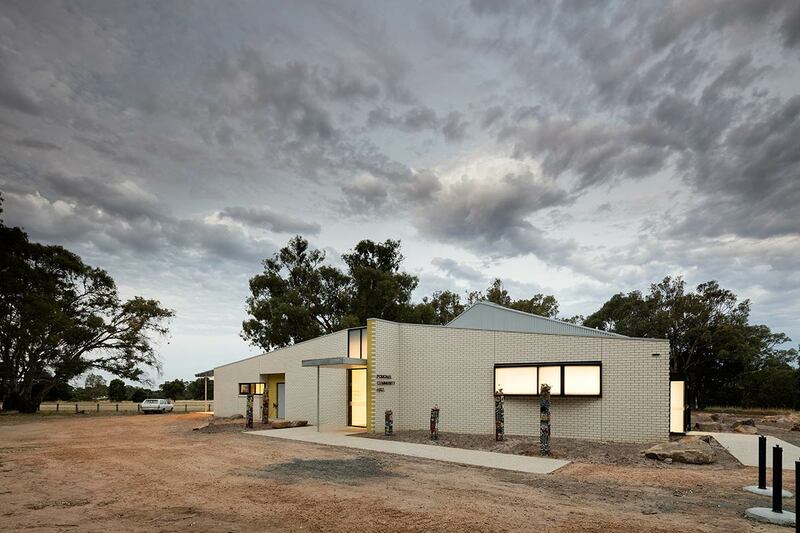 The existing post-war public hall – home to the Pomonal Wildflower Native Flower show, school art show, local community events, markets, zumba and cricket functions was an important part of the town’s memories but a failing facility. Disconnected from the oval, it could no longer support the ambitions of a growing and energetic community. 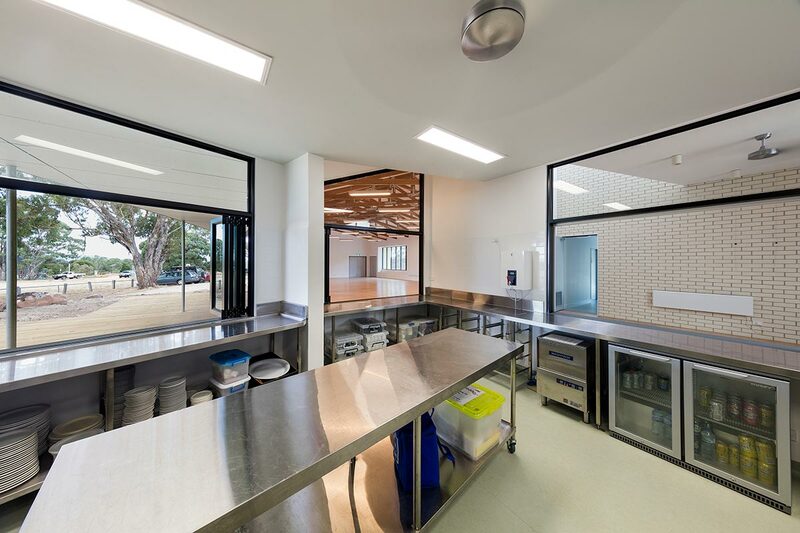 We were asked to provide a new building that could cater for the current uses of the building, both internally and externally, encompassing different strategies for renovating and extending the existing building, or replacing it with an entirely new facility. 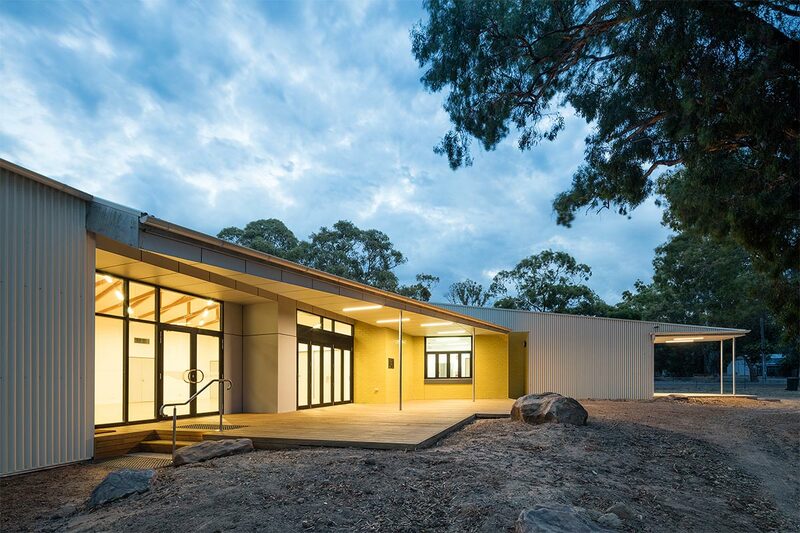 This endorsed design approach, to replace the existing hall, provides a building that is larger, more connected, embracing of the oval and strongly representing ideas about the town and its environment. 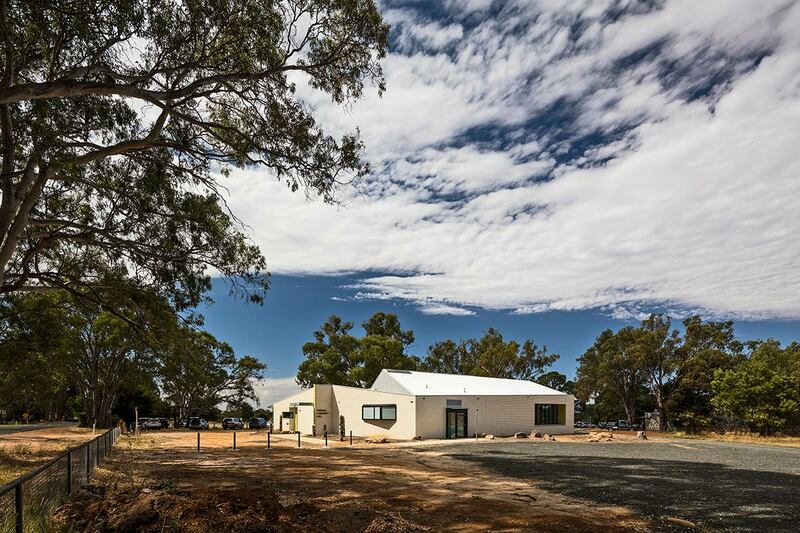 At the northern foot of Gariwerd ( the Grampians ), the form of the Pomonal Community Hall is folded across three ideas: the gable of the previous hall, a brick wall that extends the moment of apprehending the building, the informal familiarly of the shed that frames a gathering space around the oval and the town’s historic ‘Sheep Tree’. Seen when approaching the town, a brick wall of exaggerated thickness anchors the gable of the hall’s rear, unfolding to provide the building’s entry. 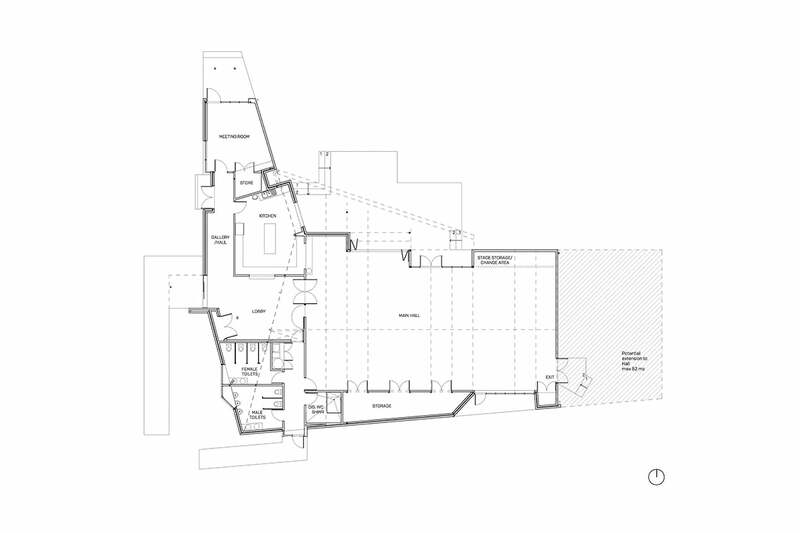 Maximising the length of elevation, it extends the duration of the building’s apprehension. For this building, the centre of the town’s community and also one of its few physical artifacts, it seemed deserving of such weight. 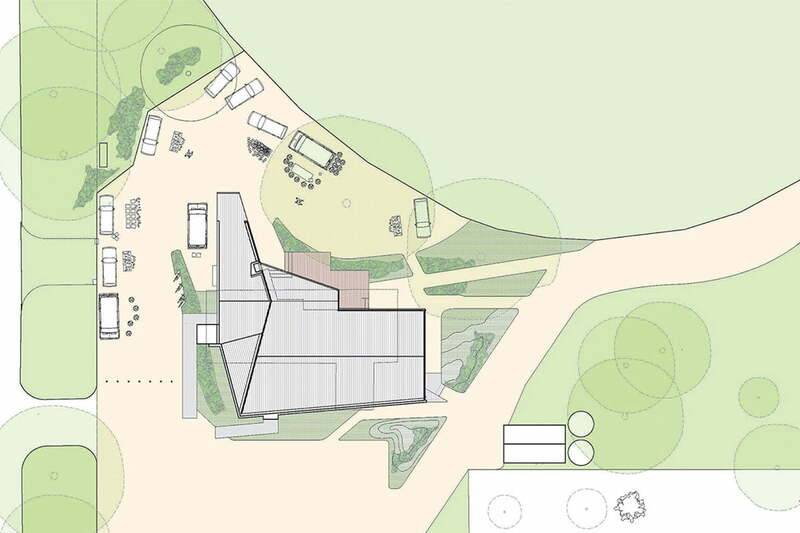 Towards the oval, the profiled metal walls and roof of the hall are drawn around a north facing gathering area and the Sheep Tree. The gable stretched taught, towards the meeting room and patio. The centre of these forces is not the hall, but the kitchen. It was clear from our research that this was its hub, and it is located to simultaneously serve the deck, hall and lobby. The internal functional arrangement relates to external use during events, such as the monthly market. 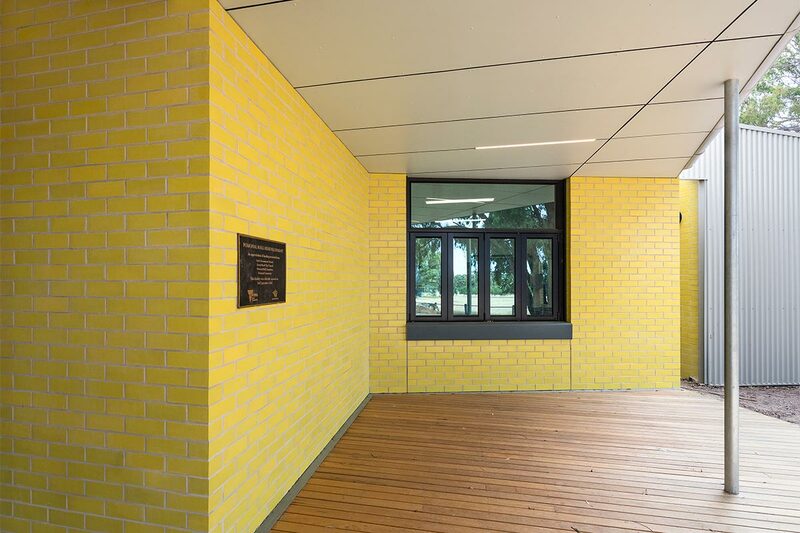 The deck, raised up from the Sheep Tree, provides an informal stage onto a courtyard area that is sheltered by this part of the town’s history. 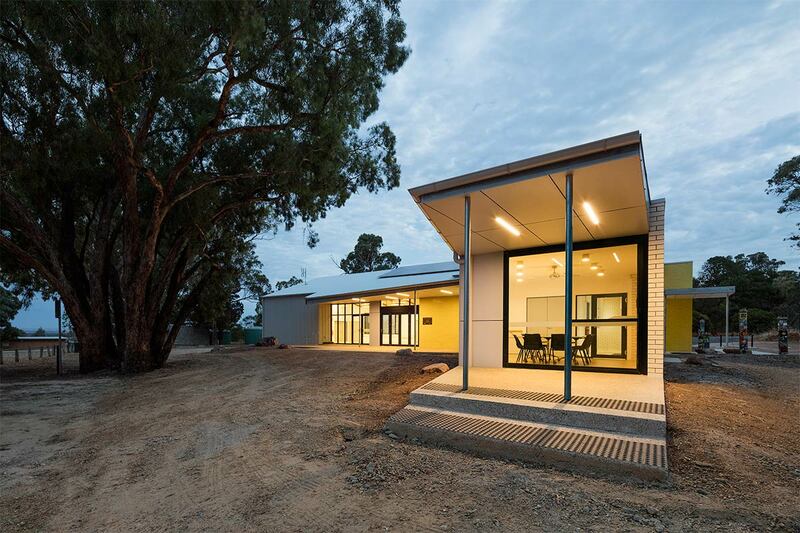 The hall’s blackbutt scissor trusses with galvanized plate connections, feature four different junction details with the surrounding walls. The junctions on the wall towards the oval reflect the stepping in and out of the wall that provides different peripheral gathering spaces. 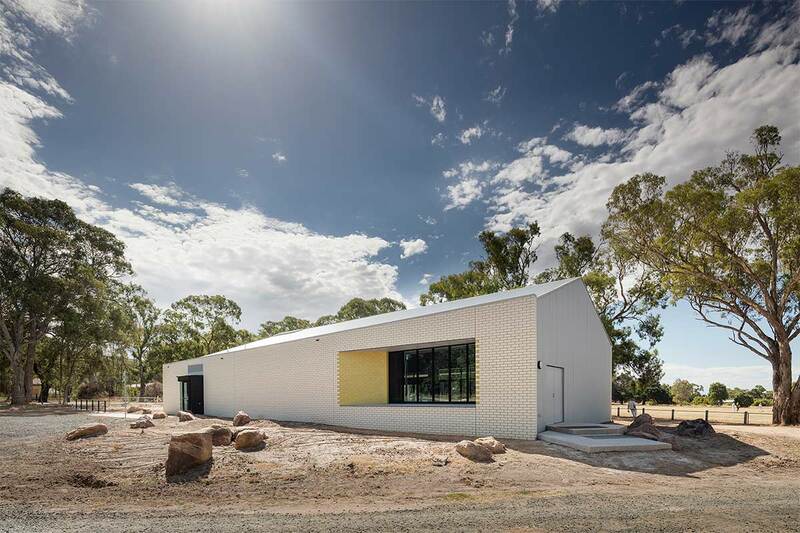 On the southern side, the trusses slide into yellow painted recesses, disclosing the thick storage space between the hall and the perimeter wall. 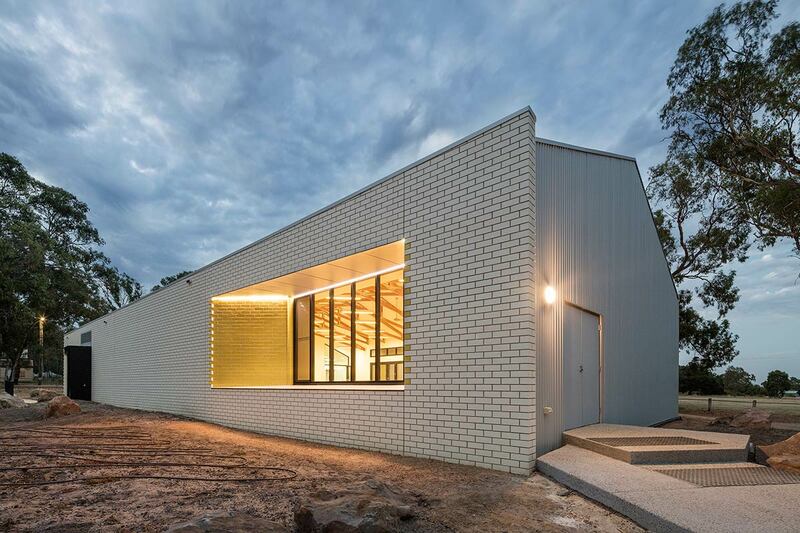 These details connect the trusses into the roof framing, avoiding ties between the trusses, yet also elevate the qualities of structure, supporting the ideas of the building at the level of detail. 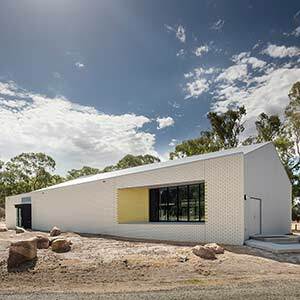 They evidence a design strategy, of selecting detail or complexity at moments and pursuing simpler approaches elsewhere, that provided a clear architecture with rich, durable materials, at low cost. This clarity reflects through all the primary materials. 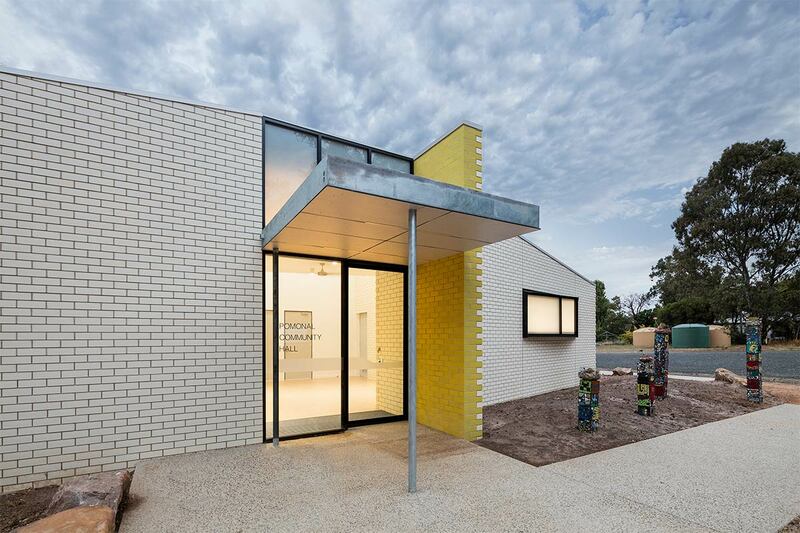 White brickwork provides a stark neutrality to the building’s form, an abstract background to yellow glazed brickwork that anchors key architectural elements; the main entry, the hall window, the kitchen servery. Brickwork junctions are detailed to appear as hinges in the building’s folding perimeter. The colour palette derives from landscape, in particular the rich array of colours seen during the spring grass growth. 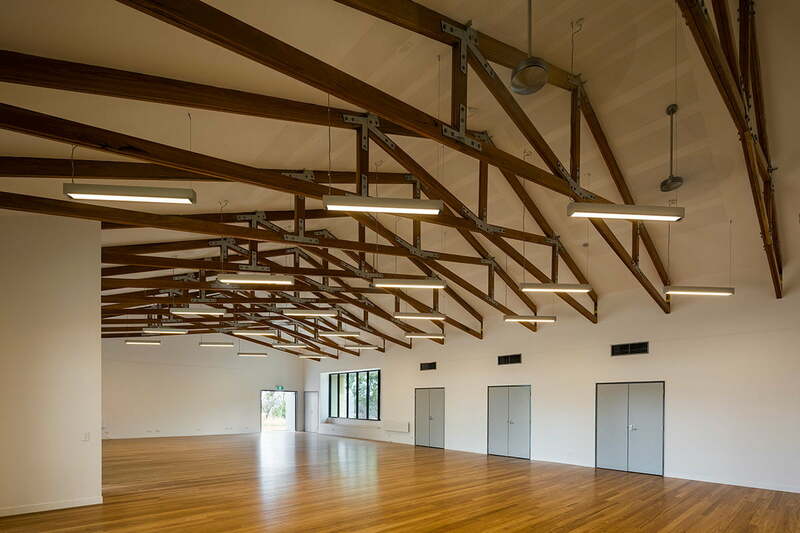 With the colours of landscape surrounding the hall, its hardwood flooring and trusses reference the occupation of landscape; of rural buildings and the floor of the previous hall.